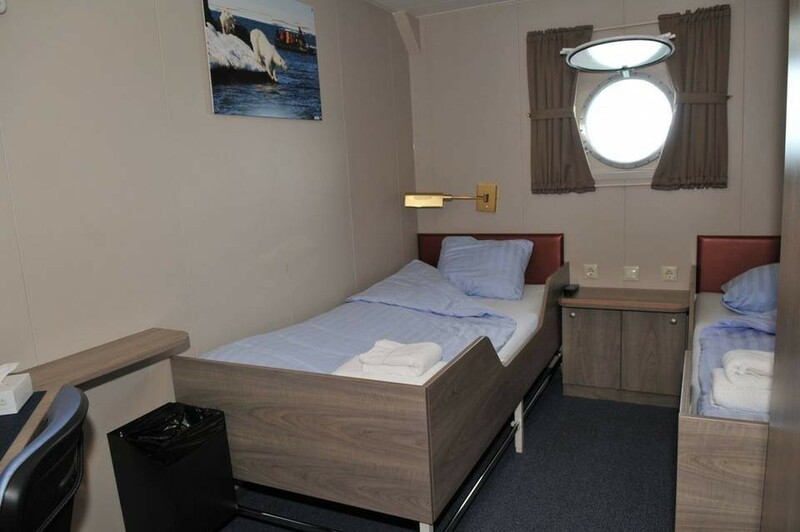 This voyage will take you further south of Antarctica, crossing the Polar Circe. 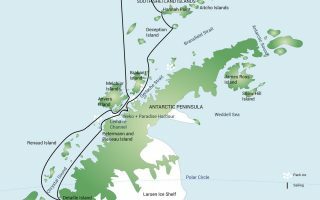 The Antarctic Peninsula is part of the Antarctic Continent and is the southern continuation of the mountain chain that runs from North America through South America into the Scotia Sea. Here it continues as a mainly sub-marine ridge, the Scotia Ridge, until it comes above sea-level at the northern tip of the Antarctic Peninsula. The peninsula consists of an 800 kilometres (500 mile) long mountain chain, the highest peaks rising to approximately 2,800 metres (9,186 feet), and numerous off-lying islands. 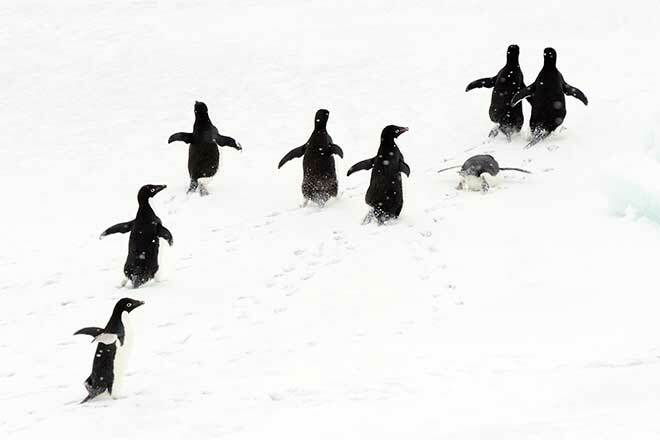 The Peninsula offers the most dramatic scenery and biggest variety of wildlife in Antarctica. Visitors are easily overcome by sensory overload by the huge amount of ice-bergs, glaciers, high mountains and the abundant and tame wildlife. 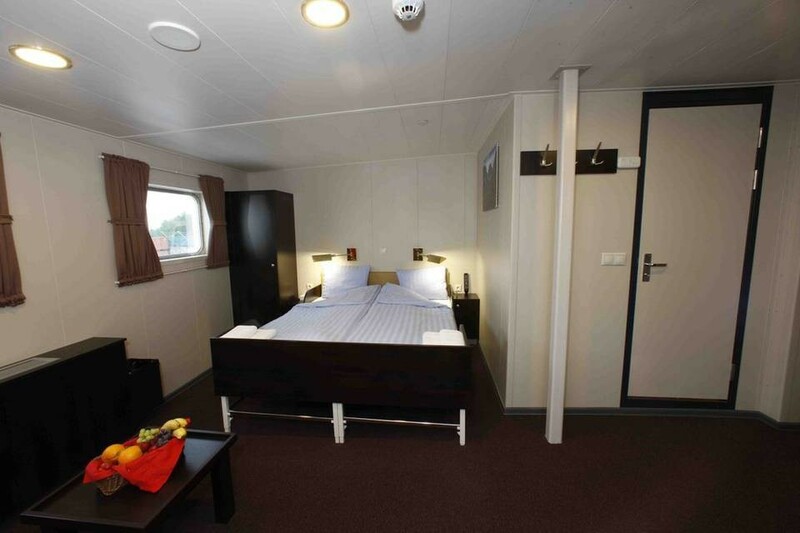 Diving & Kayaking available on this voyage – additional fees apply. In the afternoon, we embark in Ushuaia and sail through the Beagle Channel in the evening. During these two days we sail across the Drake Passage. When we cross the Antarctic Convergence, we arrive in the circum-Antarctic up welling zone. In this area we may see Wandering Albatrosses, Grey Headed Albatrosses, Black- browed Albatrosses, Light- mantled Sooty Albatrosses, Cape Pigeons, Southern Fulmars, Wilson’s Storm Petrels, Blue Petrels and Antarctic Petrels. Near the South Shetland Islands, we spot our first icebergs. The Master of the vessel may decide to sail the narrow English Strait between Robert Island and Greenwich Island if the conditions are favourable. We will then be in sight of Aitcho Island at the South Shetlands in the late evening of the third day. If the conditions do not allow us to manoeuvre through the English Strait then we continue sailing South of Livingston. These volcanic islands or the South Shetlands are windswept and often shrouded in mist and fog, but do offer subtle pleasures. There is a nice variety of flora (mosses, lichens and flowering grasses) and fauna, such as Gentoo Penguins, Chinstrap Penguins and southern Giant Petrels. We may start our first day in Antarctica with a landing at Hannah Point, where we will find a nice variety of Gentoo Penguins, Chinstraps and southern Giant Petrels, as well as Elephant Seals hauling out on the beach.At Deception Island, we will try to land. Deception itself is a sub ducted crater, which opens into the sea, creating a natural harbour for the ship. Here we find hot springs, an abandoned whaling station, thousands of Cape Pigeons and many Dominican Gulls, Brown and South Polar Skuas and Antarctic Terns. Wilson’s Storm Petrels and Black-bellied Storm Petrels nest in the ruins of the whaling station in Whalers Bay. Good walkers may hike from Baily Head over the ridge of the crater into Whalers Bay, while our ship braves its entrance into the crater through the spectacular Neptune’s Bellow into the ring of Deception Island. 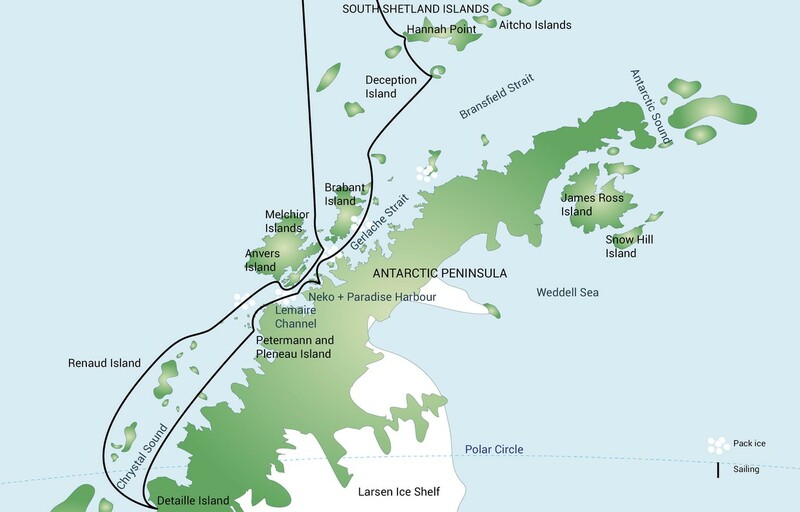 On our way further South we will sail to Orne Islands with large colonies of Chinstrap Penguins and a beautiful view across the Gerlache Strait or to Cuverville Island, a small precipitous island, nestled between the mountains of the Antarctic Peninsula and Danco Island. It contains a large colony of Gentoo Penguins and breeding pairs of Brown Skuas. In Neko Harbour and Paradise Bay with its myriad icebergs and deep cut fjords, we have the opportunity to set foot on the Antarctic Continent. We shall have the opportunity for zodiac cruising between the icebergs in the inner parts of the fjords.We sail through the spectacular Lemaire Channel to Petermann Island offering Adelie Penguins and Blue-eyed Shags. We also try to land at Pleneau Island with Elephant Seals and fair chances to encounter Humpback, Minke and Fin Whales. We head south along the Argentine Islands to Crystal Sound, south of the polar circle. The landscape is very impressive with very high mountains and huge glaciers. At the Fish Islands we land at one of the southernmost Adelie Penguin and Blue-eyed Shag colonies in the Antarctic Peninsula. At Detaille Island, south of the Polar Circle, in Crystal Sound we reach probably our farthest south. Sailing north again through Neumayer Channel and Gerlache Strait, we arrive at the Melchior Islands with a very beautiful landscape with icebergs, where we may encounter Leopard Seals, Crabeater Seals and whales. In the Drake Passage we have again a chance of seeing many seabirds. We arrive in the morning and disembark in Ushuaia. 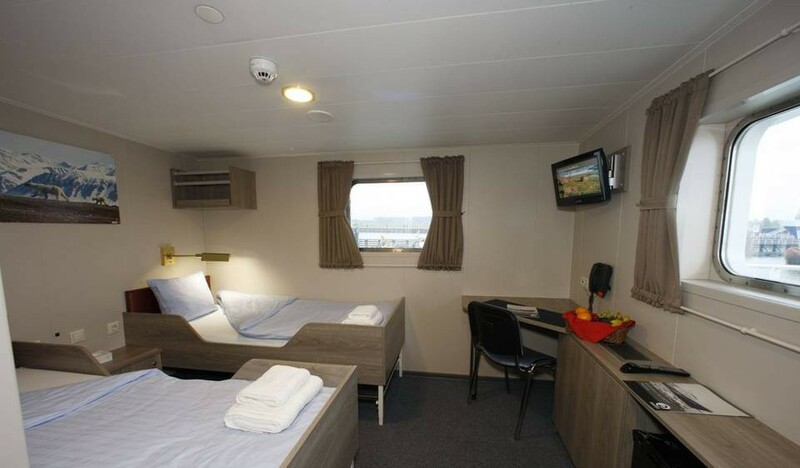 The cabin provides you with; 2 windows, 2 lower berths, Private shower & toilet, Desk & chair, Flatscreen TV, Telephone and Internet connection, a hair dryer and ample storage space. 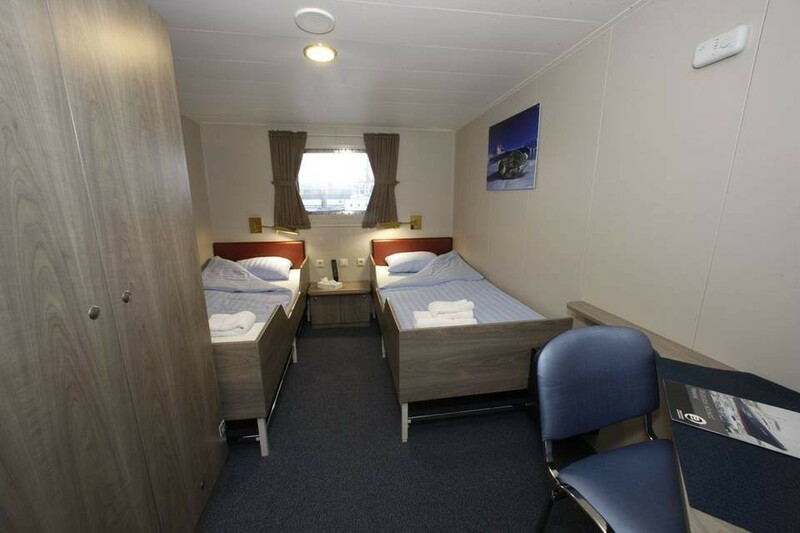 These cabins are corner cabins and are slightly more spacious than the normal twin cabins window / porthole cabins. 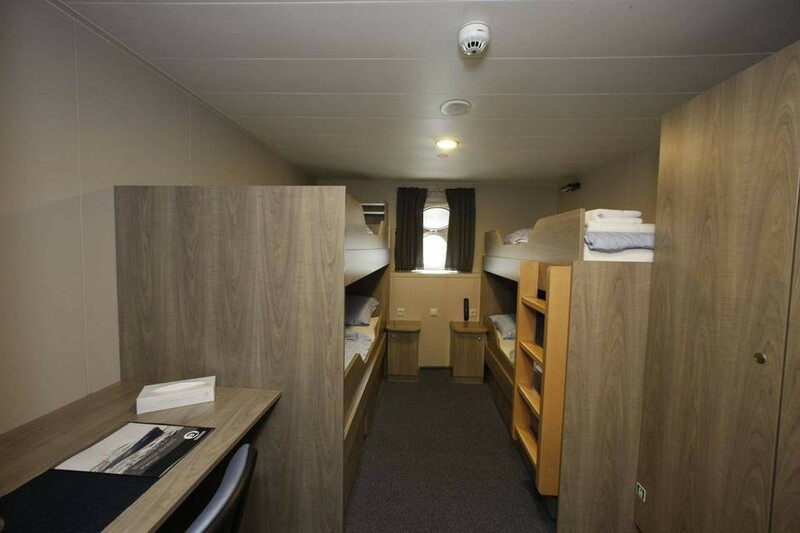 The cabin provides you with; a window, 1 double bed, 1 single bed, private shower & toilet, desk & chair, refrigerator, hair dryer, seperate day room and ample storage space.